A day before my husband’s birthday, I handed him a cake cookbook and told him to pick himself out a birthday cake. So he picked this jam cake with a chocolate ganache, swayed in part, by the photo. I figured it would be a regular cake with jam in the center layer and then frosted. Nope. This was a southern jam cake where the jam gets stirred into buttermilk (or in my case, yogurt) and baked into the batter. No sticky jam layer here. It seemed a bit odd – raspberry jam batter with cloves, cinnamon and nutmeg. Truth be told, I wasn’t sure where this cake was going. Was it a spice cake? Was it going to be heady and overly sweet with the jam plus all the sugar in the recipe? 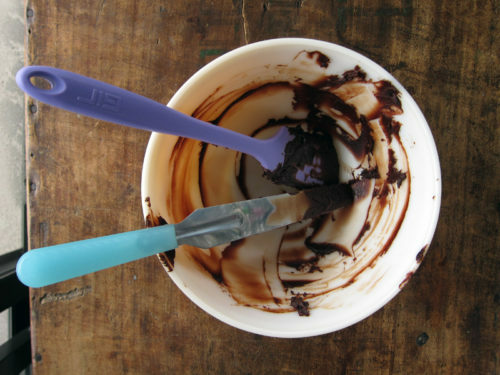 What was with the ganache frosting? Wouldn’t whipped cream suit better? I decided to let go of my reservations and just ride this cake train out as written. It was a good move. I started getting all the ingredients together and shortly realized that my organic raspberry spread was a rather small jar – not the 1 and a half cups worth the recipe needed. It was close to midnight (I tend to do a lot of midnight baking ’round these parts) but I headed to the 24-hour supermarket and picked up a store brand jar of jam and soldiered onwards. The cake itself was easy to make, the batter upon final stir was light and fluffy and smelled fantastic. After dividing the batter into cake pans and baking, the scent coming from the oven was pretty wonderful: spicy and fruity and buttery. 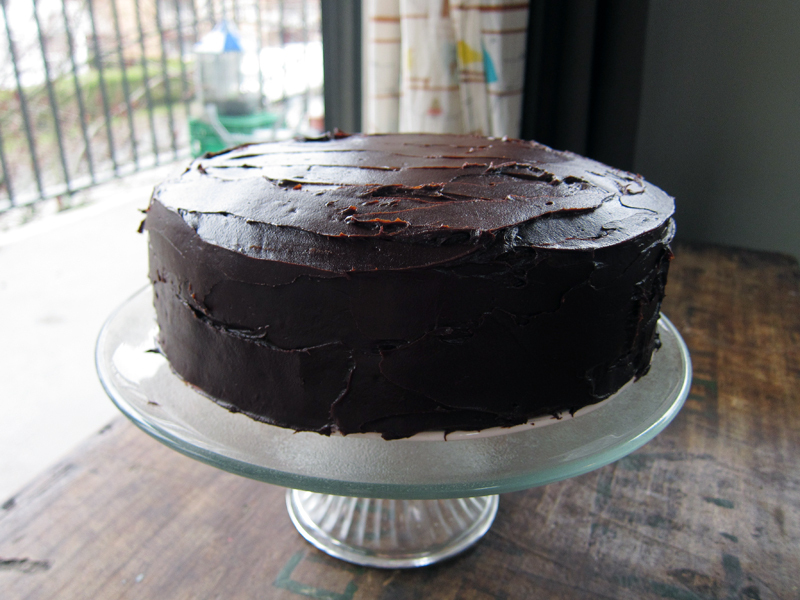 I let the cakes cool over night on the counter and the next morning I started with the ganache. Initially, I was worried as the caramel and chocolate was super liquidy and I just didn’t think it would firm up to a good spreadable consistency. But after letting it cool on the counter for a good 3 hours, it turned out to be perfect. Creamy, glossy and dark – everything a good ganache should be. So how did this cake turn out? Pretty wonderfully, in fact. I can’t say it’s my new favorite birthday cake, but I liked it because it was different from the norm. 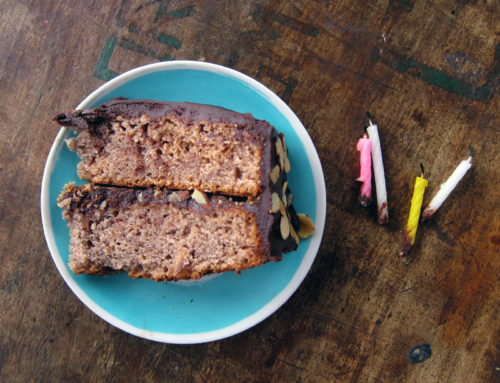 The cake itself was dense and moist without being heavy – texturally, it was quite light. The flavour was well-spiced and the raspberry jam flavour was there, but if you didn’t know, you might not guess about the jam. Maybe next time instead of raspberry, I’d try a good homemade vanilla apricot jam. I think the cake recipe cut in half would be great in the summer as an everyday cake served with fresh berries and whipped cream. That ganache? Oh boy!! That’s the real winner here. You could really taste the salted caramel mixed into the bittersweet chocolate and the combination was a true winning moment. Cornelius was thrilled with his cake and our guests loved it too. What about the almonds? The thinly sliced toasted almonds decorated the sides and were sprinkled between the layers provided a nice earthy counterpoint and crunch. But how stunning are they pressed onto the sides of the cake? They reminded me of the kind of decorative stonework you might see on a 1960s building – I wish I could have taken a better photo. Trust me, it was as gorgeous to look at as it was to eat. Happy birthday cake indeed. elsewhere: The easiest bread ever and I’m totally not kidding. Head to Poppytalk for the recipe and the discussion. It’s even easier than the famous no-knead bread!!! Bake up a loaf this afternoon. Center the rack in the middle of the oven and preheat to 325F. Butter & flour 2 9-inch round cake pans, adding a circle of buttered parchment to the bottom of each pan. In a large bowl, whisk together the flour, baking soda, cinnamon, nutmeg, cloves and salt. In a small bowl, stir together the jam and yogurt. In the large bowl of your stand mixer, cream the butter and sugar together over med-high speed until fluffy, about 5 minutes, scrapping down the sides of the bowl as necessary. Blend in the eggs one at a time. Turn the speed down to low and add in the flour mixture in 3 parts, alternating with the yogurt/jam mixture, beginning and ending with the flour. After each addition, scrape down the sides of the bowl. Stop the mixer before the last of the flour has been incorporated and complete the blending by hand with a rubber spatula so as to not overmix the batter. Divide the batter evenly into 2 9″ prepared cake pans, smoothing out the tops. Bake in the middle of the oven until the centers are just barely firm when lightly touched (32-40 minutes) – use a cake tester to be sure they’re baked all the way through. Cool the cakes on a wire rack for 30 minutes before removing them from their pans. Once removed, cool cakes completely on the rack, top side up. Leave the parchment paper on the cakes until ready to frost. To assemble the cake, place one of the layers top side up on a cake plate (remove the parchment!). 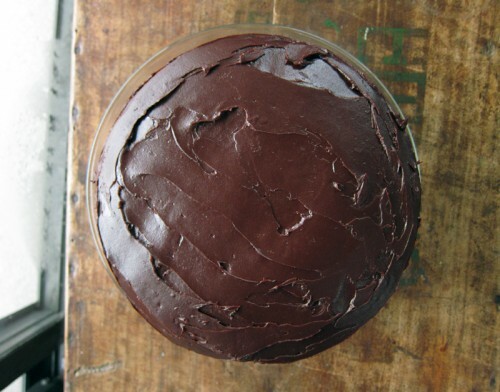 Using a thin metal spatula, spread a thin layer of the ganache on top of the cake, spreading out to the edges. Sprinkle 2 tablespoons of almonds overtop. Align the next cake layer (remove that parchment ), top side up on top of the first layer and frost the top and sides with the remaining ganache. 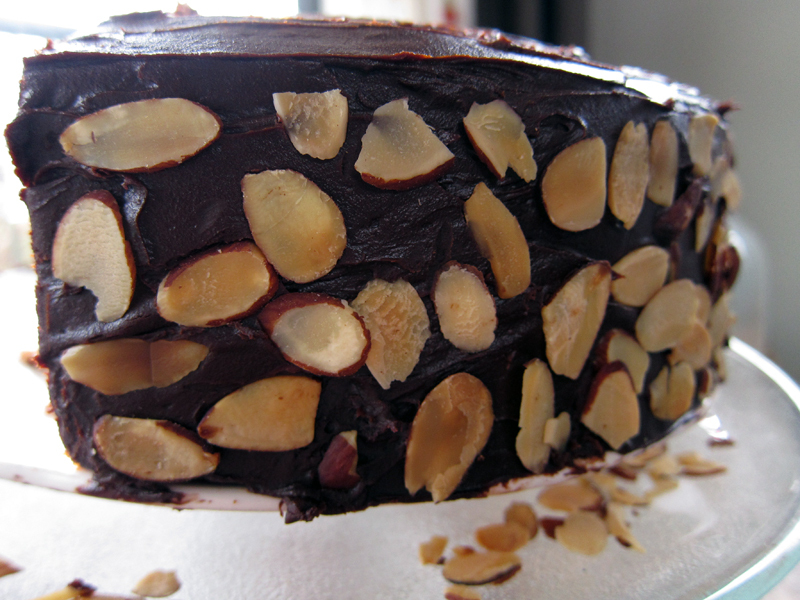 Lightly press the toasted almonds on the sides of the cake. This cake is best stored and served at room temperature. In an airtight container, it keeps for up to 5 days. 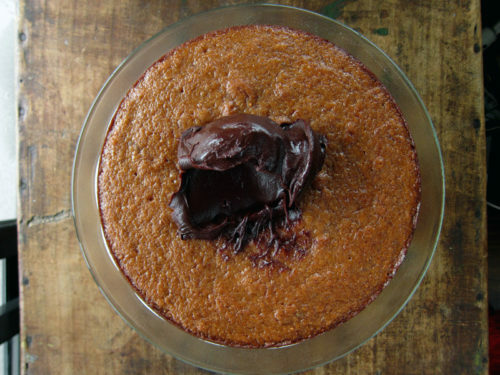 Put the chocolate into a small heat-resistant bowl and set aside. In a medium saucepan over medium heat, add in sugar, water, and lemon juice and stir until sugar is dissolved. Put down the spoon (no stirring!) and bring to a boil, occasionally washing down the sides of the pan with a sillicone pastry brush dipped in water. Swirl the pan to distribute the heat. Cook until the syrup turns a dark amber colour. Remove from heat and very slowly pour in cream and then stir in the butter and the salt. Place the saucepan back on the heat and stir to combine all the ingredients. Once incorporated into the caramel, pour over the chocolate, swirling the bowl so that the chocolate is completely covered. Let sit for 5 minutes. With a whisk, stir the mixture slowly until you have a glossy frosting. It will be more liquidy than you need, but leave it to cool on your counter for the next 3 hours, stirring now and then until you get to a good spreadable consistency. Oh man, that looks great! I love the sound of the jam and spice together, but oh, the ganache!! I must frost something with that, soon. I like the sounds of this one. Always on the hunt for something new/different when it comes to birthday cakes! This recipe rocks!!! Thanks for sharing. Your husband is a lucky man! Oh, what I give to have someone hand me a book of cakes and tell me to pick out whichever one I wanted, AND then make it for me to eat and enjoy. The cake sounds really interesting and the ganache looks downright dreamy. That looks delicious! I was sold at salted caramel ganache! What a great idea to give someone a cake book and ask them to choose. You get to make something that you might not have chosen, and they get a cake they will really enjoy. Yeah, he knows, it, Amanda. I wonder what it would be like for someone to give me the same treatment – oh to dream big!! 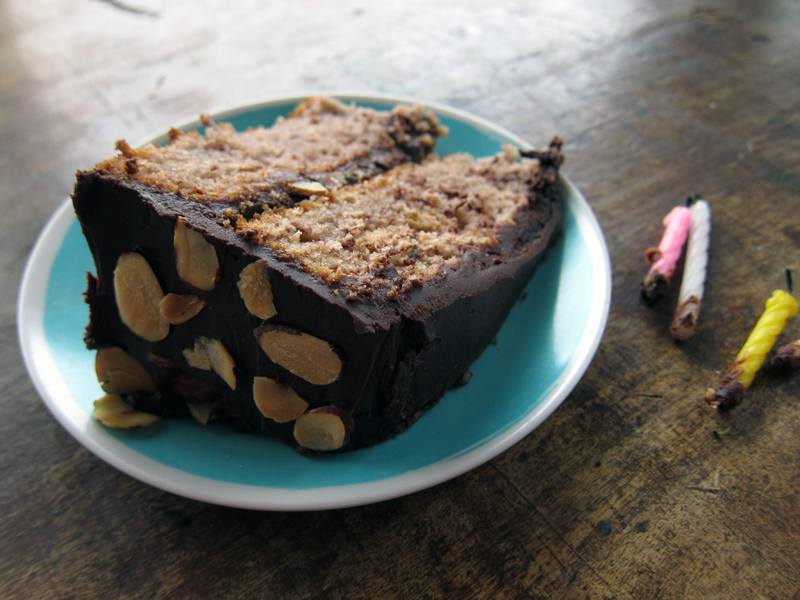 I love the ‘pick what you like out of a cookbook and I’ll make it for you’ idea 🙂 And I like the sound of this cake too – with the sliced almonds of course. Your husband is such an out-of-the-box thinker when it comes to dessert, huh? I probably never would have chosen this if given an entire book of options, but in truth, the finished product does sound and look wonderful! That ganache sounds like a keeper! I’ve never heard of this kind of cake either but it sounds kind of dreamy. Odd, but dreamy. Do you think this would work as a sheet cake? I love blackberry jam so would probably try that. Thanks Joanne, it wasn’t something I’d probably pick out, so it’s a great way to get introduced into something new & different! And tasty too! Ha, totally, Jess. I never thought he would be, I even asked him if he looked at the recipe or just the photo! Yes, odd & dreamy is probably an aft description, Joanne! Catherine, I have no idea if it would work as a sheet cake, but I have no reason to imagine why not. I’ve never made a sheet cake before (to be corrected for sure), but I imagine you’ll have to probably cut the recipe in half and reduce the baking time. If you do try, let me know how it turns out. Glad to hear you loved this cake, Nabeebs! !